I received a bag of mate as a Christmas present. I have tried the free samples of Samurai Mate tea from Teavana. 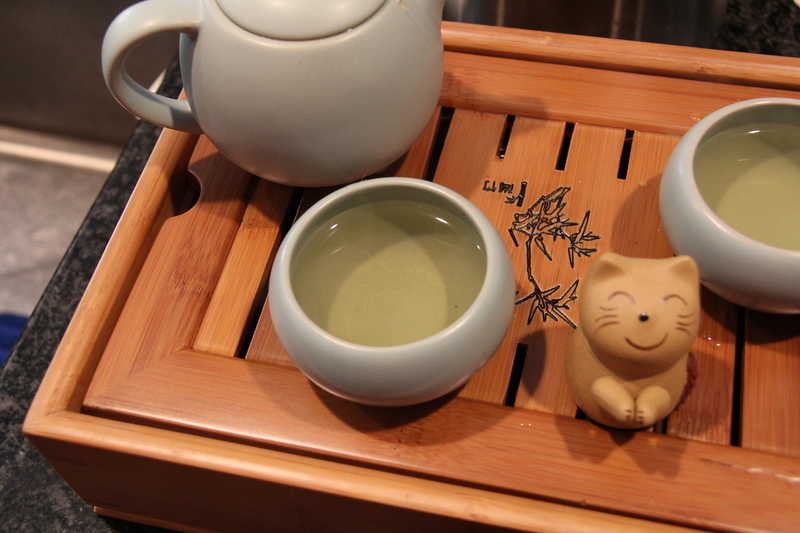 The samples were too sweet for my taste as I drink my teas plain. However, I love the flavors! Yerba Mate comes from South America from a tree called Ilex paraguariensis tree. It does have caffeine. It contains vitamins A, B1, B2, Niacin (B3), B5, B Complex C, and E. Minerals: Calcium, Zinc, Manganese, Iron, Selenium, Potassium, Magnesium, and Phosphorus. And other nutrients: Carotene, Fatty Acids, Chlorophyll, flavonol, Polyphenols, Inositol, Trace Minerals, Antioxidants, Tannins, Pantothenic Acid and 15 Amino Acids. Since it has so many vitamins and nutrients, it is an all around feel good drink. It has been looked upon as a healthy alternative to coffee. Looking the ingredients up at Teavana website, I realized the spices I love are cinnamon, cloves & cardamom. I dislike dried fruits in a tea blend. I prefer to drink tea plain along with dried fruits to control the sugar intakes. I decided to make my own blend of mate tea with whole cinnamon sticks and whole cloves which I happen to have in my pantry. Of course, you can add orange peels and any other spices you love! Not only do you custom blend your own tea, but also save $$! I first crushed the cinnamon sticks and whole cloves with granite mortar and pestle as you can see from the pictures. The amazing aromas they released are just incredible! Then, mate and crushed cinnamon and cloves were mixed in thoroughly. How much cinnamon and clove do you need? I used twice as much cinnamon as clove. 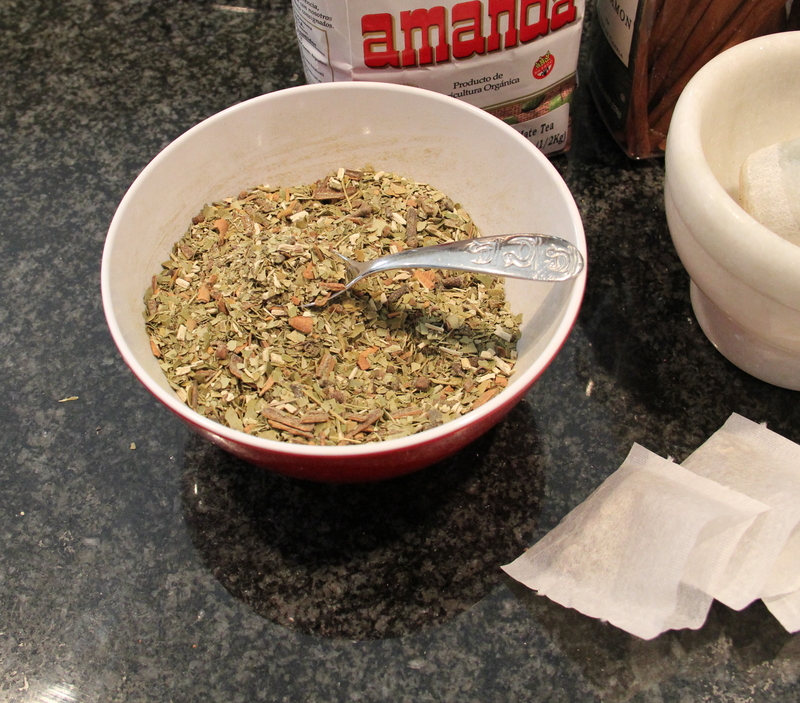 The combined spices are approximately about 25% of the mate you use. I use the empty teabags that can be heat sealed with just an iron. Put in just enough mixture to fill 1/2 of the bag. Otherwise, the tea bag will burst open due to the content expanded in hot water. Now, you are almost done! 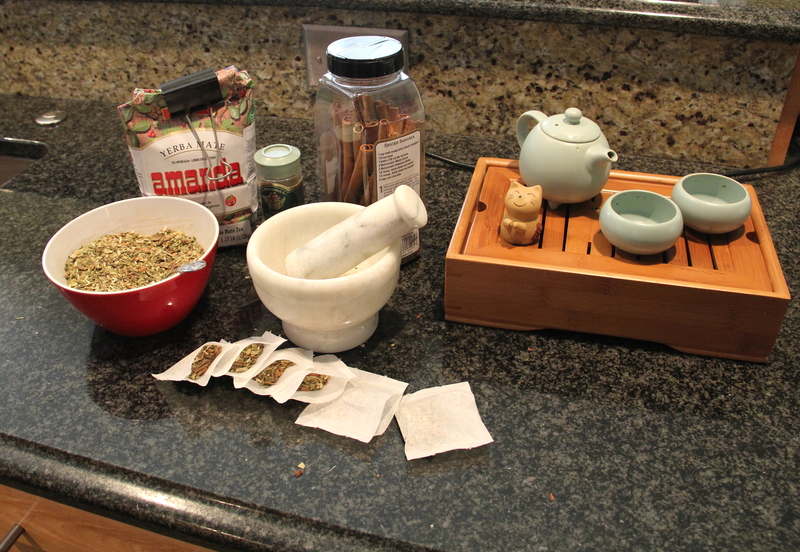 Time to brew a nice hot pot of mate tea! The cinnamon and clove are detectable, but subtle while you can still enjoy the true taste of mate! You can add some rock sugars to the tea or enjoy the tea along with some dried fruits!